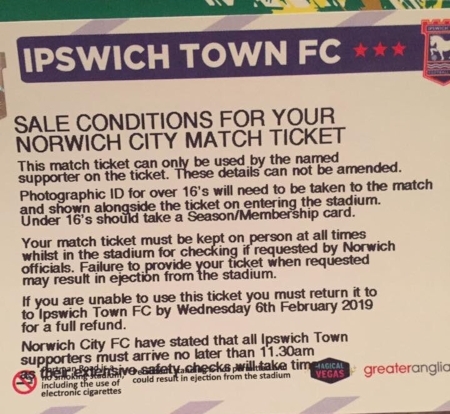 Town fans attending the East Anglian derby against Norwich City at Carrow Road on Sunday 10th February will be subject to a list of strict sales conditions outlined to them when they receive their tickets. Those tickets, costing £40 for adults, which are sold one per customer number via the usual priority scheme, must be used by the supporter associated with that customer number, which is printed on the ticket along with their name. Fans aged over 16 must take photographic ID to the match, to be shown to officials on request along with their ticket, which supporters are told they must keep on their person at all times, or risk ejection. As has been the case in recent years, the match, which is being shown live on Sky Sports, kicks off at 12 noon but fans have been told to ensure they arrive “no later than 11.30am as the extensive safety checks will take time”. While East Anglian derbies have been heavily policed and stewarded for some years, the conditions ahead of February’s game represent an escalation. On Friday, five men are due to appear at Norwich Magistrates' Court, charged with offences relating to damage caused to the away end at last season’s Carrow Road derby where electrical cables and guttering were pulled down. Orwell warned us about such things. Scum FC and Norfolk Plod are a disgrace in the wa6nthey treat Town fans. Feck the lot of them. i will never set foot in that shyte hole again. What a load of tosh, away days such as this one just ain’t no fun anymore. It was pretty scary and shameful to be around supporters ripping seats out or doing other damage, so I decided I would never go again. That is what they are trying to stamp out. I honestly don't understand how this 'Derby" game can be enjoyable for the fans what with this ridiculous Sunday Kickoff time and all these restrictions why would anybody wish to suffer when other, potentially more troublesome local rivalries don't! Last time I attended there nearly 40 years ago fans were only separated by the Barcaly Stand fence! Even they should be embarrassed at this given the free reign and pub option they get when they come to us - I say treat em the same way. F#%k em. So because ten or so out of 2,000 decide to misbehave they treat us all like criminals and we pay £40 for the privilege !!!!! It's a game of football for crying out loud. Get tough with the wrong uns and let the rest of us enjoy our day out. Half of the comments above are great examples of exactly why these strict conditions are put on away fans at derby games. This amount of unnecessary toxic language, followed by match day highs and mob-mentality always ends up leading to violence. That Forest fan was killed not long ago from the exact kind of behaviour they're trying to prevent during this game. Sadly, it is clearly warranted. A minority of mindless people spoiling it for the majority - whoever you are you cannot condone the behaviour of ripping seats out, wilful damage, etc; anywhere. Any ITFC 'so called Supporters' responsible for such should be thoroughly ashamed of themselves, and banned from both Club. Definitely NOT True Blues for sure - but pretending to be. Just an insult to our Club. Action by mindless idiots, affecting everyone else. It’s been almost 10 years since I set foot in Carrow Road. Herded around by police and treated like a criminal. Not for me anymore thank you! Even cables and Guttering were torn down - therein lies Health & Safety issues which the Club have to act firmly on. Get your behaviour together - or stay away, and do us all a favour. No Excuses. If people act like criminals - expect to be treated appropriately. Behave - or you will be letting Paul Lambert down, and our Club. Feck em stay at home . I expect the ones who caused trouble at last year’s game don’t go to any othe Town games. They just go to that particular one to cause damage. It means everybody else has to suffer the consequences. People without season tickets but go regularly to home and away games have to miss out because of a few idiotic thugs! Having witnessed some alcohol fuelled ITFC "supporters" at away games I am not surprised that the rest of us require police protection! Handbags, much like the derby itself tbh. Pathetic all round. ......... SouperJim - trying to wreck the stadium is a weird interpretation of 'handbags' in my book. If you were one of the guilty - STAY AWAY - and do yourself, and ALL respectful ITFC 'Real' Supporters a huge favour. In so doing let decent supporters enjoy their day. NONE of us want you there. UNDERSTOOD ..... !! Those who are attending. No matter how much crap you have to put up with... at least you won’t get told to fcuk off by your own manager when we score.